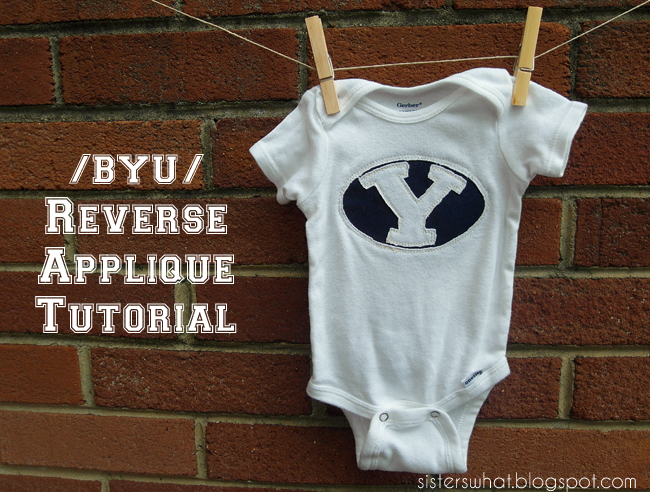 ' /BYU/ Reverse Applique Tutorial - Sisters, What! I've kind of been obsessed lately with customizing onsies and shirts lately. There are just so many fun ideas out there I just want to try them all out. As my husband has said, I just really love cute and small clothes. True story. Also, this is proof that their are awesomely cute boy clothes options out there. So stay tuned for the next month and half as I slowly post all the onsies I've made. 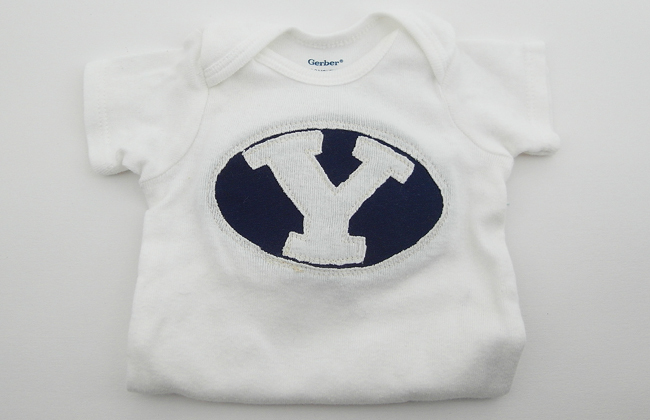 My Alma mater is BYU and like many, I like to dress my kids in such attire. 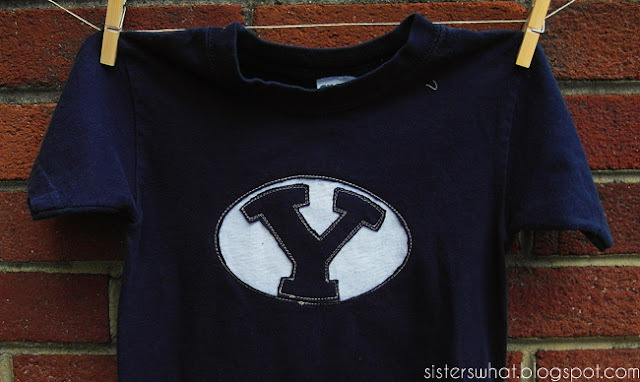 As my dad has asked many times "why do we feel the need to indoctrinate our children at such a young age with BYU attire?" 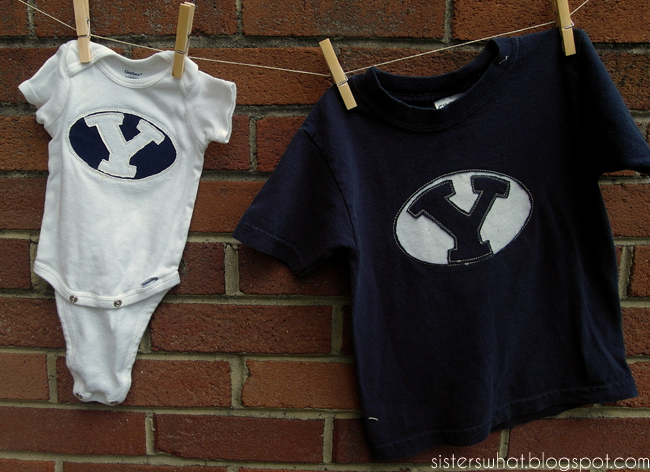 (he went to the rival school the U of U). Well, the most impressionable years are these young years, and so we must impress the right things ; ). 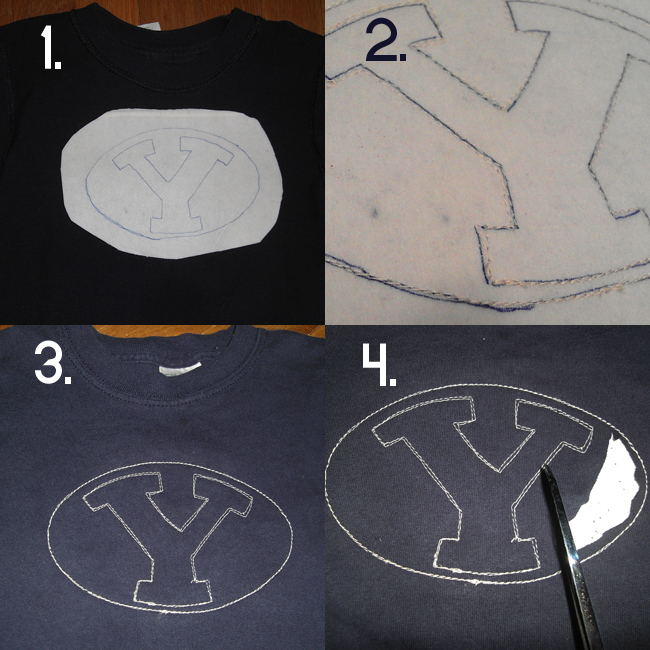 And besides, look how happy our boy is to wear his new BYU shirt. This is him making a Y and yelling it at the same time. Start them while they're young I say. This is such a fun and easy technique in which you can make all sorts of fun designs. //1// [a] in photo shop or word, determine the size you want your design to be. Then flip it so it's backwards then print. [b] with the ironable side faced down, place the interfacing on top of the printed design then trace the design on to the interface. [c] Next iron the interfacing to your contrasting fabric. Turn your shirt inside out and place your contrasting fabric/interface onto the inside of the shirt where you want the design to be. This is how it should line up: inside of shirt, contrasting fabric with interface ironed on top. //2// Now following your traced design, sew through all layers. //3// Turn your shirt right side out. You will see your lovely design. I was almost tempted to leave it like that. //4// Now very carefully cut away negative space of the main SHIRT fabric layer only (be really, really careful not to cut through the other layers). Again, only cut the top shirt layer. And your done!